A look into my pastimes, sometimes with personal poetry. It’s pretty clear here that I have a fixation. Refer to my other DIY on crane crafts for a video on how to make paper cranes, if you don’t know how. Also, I continue to put old magazine paper to use with magnetic bookmarks. Today, I touch upon what to do with old coasters, rather than remaking them while keeping the same purpose. I’m unashamedly loyal to paper books. Send me a PDF of a work you want reviewed, and I’ll most likely print it out and keep it in a 3-ring binder for future reference. I like to flip through what I read, and yes, I don’t feel guilty with highlighters and pens. However, I’ve recently learned that it’s probably better to write your notes on Post-It notes instead of the page itself. 1. I got a cork coaster I wasn’t using anymore. It was an ordinary brown one with a picture of an anchor stamped in the center. It was already stained and losing its appeal. 2. I laid out newspapers on my floor and painted the cork coaster with acrylic paint. Any color works. That day, I was feeling pink. 3. I got out a crane, already folded, and flattened it out. I made sure it was void of extra dimension by wedging in between the pages of a dictionary. I proceeded to pile several heavy books on top of the dictionary, for a good 4 hours. 4. I Mod Podged the flattened crane onto the painted coaster. I made sure to cover the entire crane and coaster surface with 4 layers of Mod Podge. You can do this with either a sponge or paintbrush. 5. Let it dry! An hour and a half prevents disappointing mess-ups with a sealer that may still be sticky. 6. I got out the Exacto knife, outlined a circle to cut out at the coaster’s edge, and made the slot for my ribbon (the page marker, more or less). Be careful. Do not cut the circle to where there is very little space between the coaster’s actual edge and the edge of the ribbon slot. You’ll end up having a really flimsy end and the coaster, if made of cork, will break apart. Be careful, and take your time. 7. Take some ribbon. 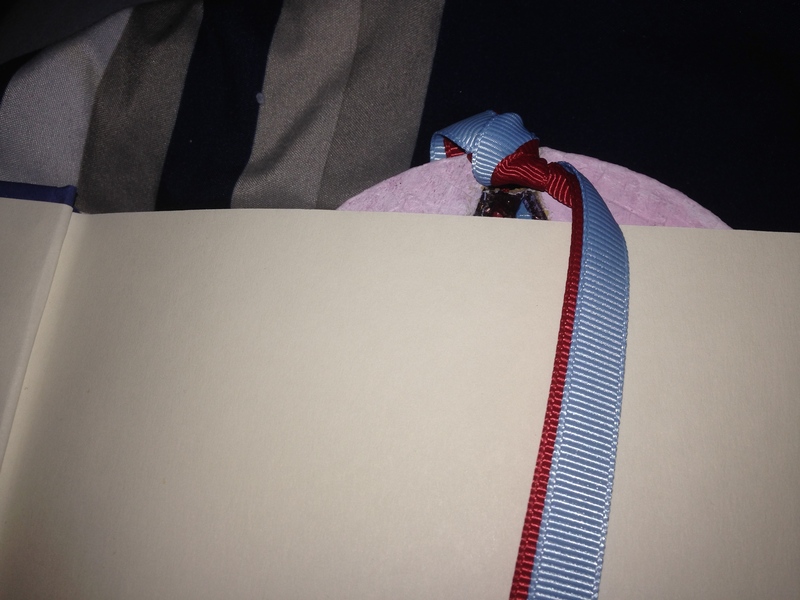 I chose to use blue and red, of equal length, slip them through the slot, and tie a neat knot. You may choose to make a bow and add beads to your page marker. It’s entirely up to you. 8. I then took a pen to outline the flattened, pasted crane. I should mention that I painted the flattened crane after Mod Podging it as I wanted the bird to match the colors of the ribbon. Of course, this is also optional. *For added fortification, you may consider spraying acrylic sealer over the piece before slipping ribbon into the slot. You will need: Cardstock, magnetic tape (from Walmart in a duct-tape-roll-kind-of-format). Mod Podge, a gluestick, scrapbook paper, a ruler, scissors, and yes, paint. 1. Get out your cardstock. Use a stencil or with fantastic improvisation, cut out two rounded rectangles. The size and shape to match an iPhone is ideal. 2. After cutting out the cardstock, paint it. I chose lipstick red for mine. 3. Get some scrapbook paper. Cut two rounded rectangles out of the paper, and with your gluestick, stick the scrapbook paper to the back of the cardstock. Be sure to press down and smooth over your project with diligence so that the inside scrapbook paper doesn’t “peel off” later due to a weak adhesive. 4. Apply a layer of Mod Podge to the painted side of your cardstock bookmark. Let dry. This should be no problem as folding the cranes may be time consuming, depending on your folding abilities. 5. With scrapbook paper, cut out squares (and you would do this with a ruler). I chose to do tiny paper cranes, so my squares were 1.5” by 1.5”. 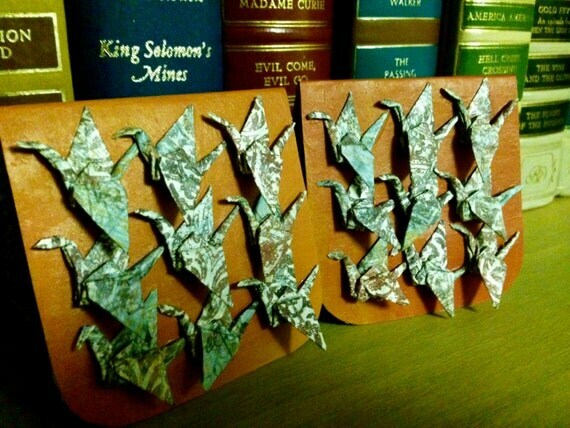 In total, I folded 18 cranes (9 on each bookmark), and it took me a good two hours. Why? Because I’m such an inept folder. 6. Refer to my DIY with the cranes in the glass candle holder (they’re resting on rocks and are sheltered by a lid painted red). 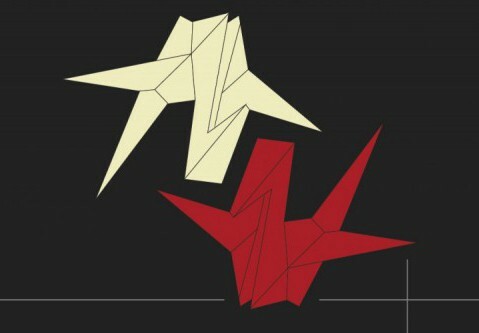 I’ve included a link on how to fold paper cranes. 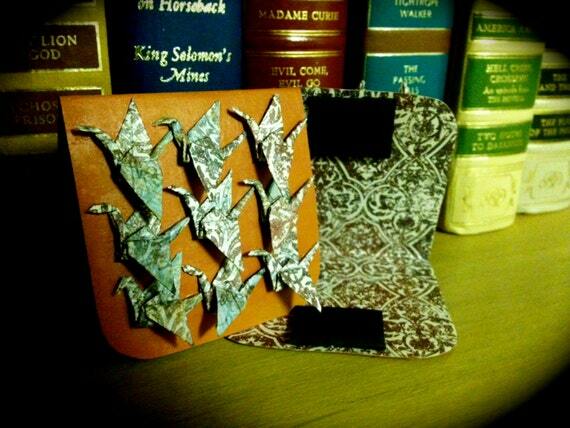 With the scrapbook squares you’ve newly snipped, make some cranes. For my bookmarks, I made 18. 9 on each bookmark, I repeat. By the time you are done, the Mod Podge applied to the painted side of your cardstock bookmarks should already be dry. 7. 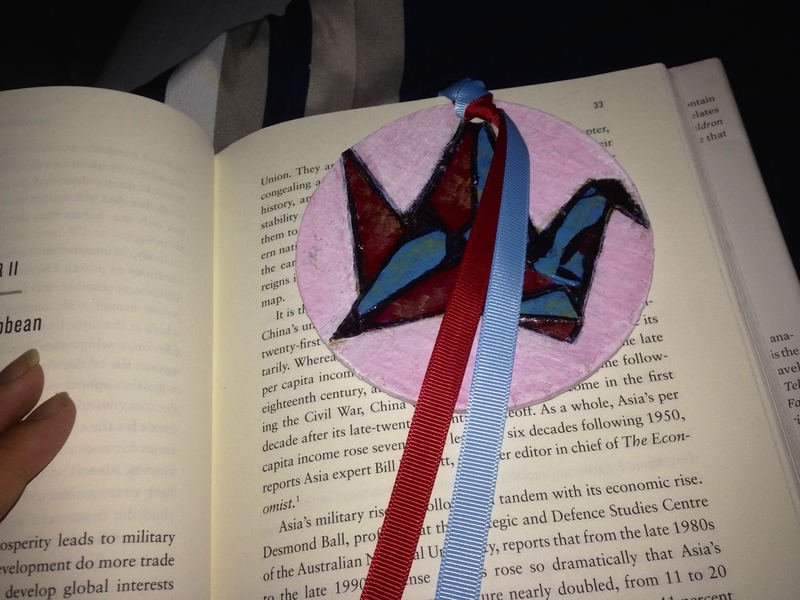 Some paste the cranes on the bookmark with Mod Podge. I choose to first glue them with the Elmer’s Gluestick. You want to be very careful either way as the paper is already quite delicate and you don’t want to shred or rip your cranes. After I glued each crane on the cardstock, I applied a layer of Mod Podge, both to the cranes and the painted surface one again, in between. 8. Apply two more layers of Mod Podge to fortify the cranes. Allow twenty minutes between each coat to dry. After the last coat, wait a good thirty minutes. 10. Allow an hour for the glued magnetic strips to dry. TIP: For added longevity, you may want to coat your bookmarks (the outside only!) with acrylic sealant spray (clear and glossy, perhaps?). Ultimately, enjoy. These make great gifts, as well as simple time soakers to calm your nerves and add charm to your books!